World Economic Growth Points To More Planes In Asian Skies : Parallels Airbus, the second-largest aircraft-maker, says that in 20 years China will overtake the U.S. as the world's top aviation market. The estimates are similar to projections issued by Airbus' bigger rival, Boeing, earlier this year. 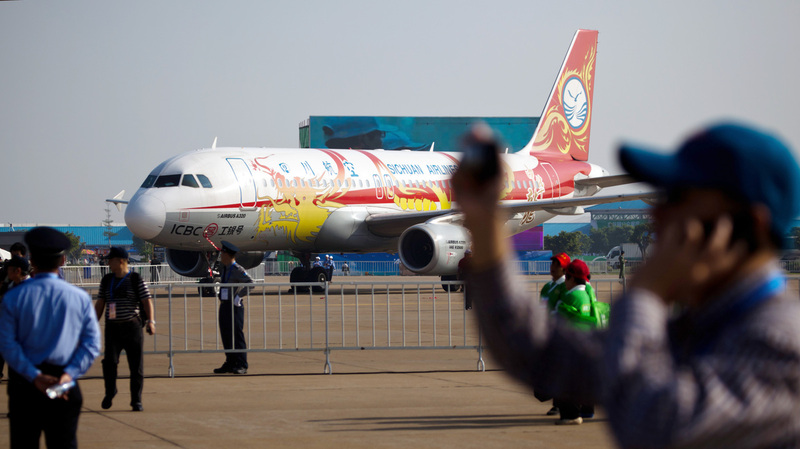 An Airbus A320 on display during Airshow China 2012 at China International Aviation Exhibition Center in Zhuhai on Nov. 13, 2012. Increasing prosperity and urbanization in China and elsewhere in Asia will drive the global demand for aircraft, Airbus said Tuesday. The number of global megacities will grow from 42 today to 89 by 2032. The global middle class will more than double by then. And most of this growth will be in the Asia-Pacific region. What does all this have to do with global aviation? Airbus, which released the data Tuesday, says that to meet this demand nearly 30,000 new planes will have to be built over the next 20 years. "By 2032, Asia-Pacific will lead the world in traffic overtaking Europe and North America. Today on average, a fifth of the population of the emerging markets take a flight annually and by 2032, this will swell to two-thirds," John Leahy, chief operating officer for customers, said in a statement. "The attraction of air travel means that passenger numbers will more than double from today's 2.9 billion, to 6.7 billion by 2032, clearly demonstrating aviation's essential role in economic growth," he said. Asia-Pacific accounts for 36 percent of new passenger aircraft demand; Europe, 20 percent; and North America, 19 percent. The numbers are a reflection of the growing economic importance of the region over the past two decades. Increasing prosperity in countries such as China, now the world's second-largest economy, means more people can afford to fly. "In 20 years, the No. 1 market will not be the U.S.; the No. 1 market [will be] internally within China," Leahy said in London. Airbus is the world's second-biggest aircraft-maker. Its bigger rival, Boeing, released its own forecast in June. It predicted more than 35,000 new planes over the next 20 years. "Airbus hiked its forecast for demand for long-distance twin-engined passenger jets such as the upcoming Airbus A350 and Boeing's 787 Dreamliner by 4.3 percent to 6,779 aircraft. The forecast for short- and medium-haul jets like the Airbus A320 and Boeing 737, which dominate production by the world's largest planemakers, was lifted by 3.7 percent to 20,242 jets. "But amid recently slow sales of its 525-seat A380 superjumbo and Boeing's 747, Airbus kept its forecast for the world's largest jetliners flat at 1,334 aircraft. Boeing is significantly less optimistic on demand for the industry's four-engined mammoths, saying powerful twinjets such as its soon-to-be-revamped 777 have displaced many of them. Airbus says urban growth will support superjumbo sales." Although projections for both aircraft-makers are optimistic for the next 20 years, the trade group that represents many of the world's top airlines was markedly less so in a report released Monday. The International Air Transport Association revised its 2013 global industry outlook downward, citing "oil price spike associated with the Syrian crisis and disappointing growth in several key emerging markets."